Unfortunately bikes are easily stolen. If they’re not locked down than anyone can jump on the saddle and pedal away. I once witnessed a woman cyclist sitting down at a bench eating a sandwich. Next to her was a beautiful road bike leaned against the bench. Out of nowhere a man snatched her bike, jumped on the seat, and jet away. He was gone in a flash. There was no way that anyone was going to be able to catch him on foot. The bike was gone. The poor woman was distraught as anyone in her position would be. 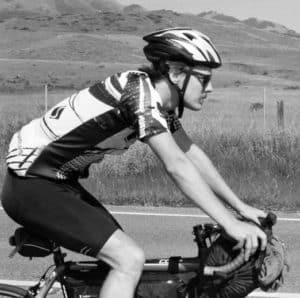 Sadly, this is one of many bike theft stories and a good reminder that you should ALWAYS lock your bike when it’s not in use. One of the best types of locks you can purchase to keep your bicycle secure is a u-lock. U-locks are sturdy, functional, and great at frustrating thieves. 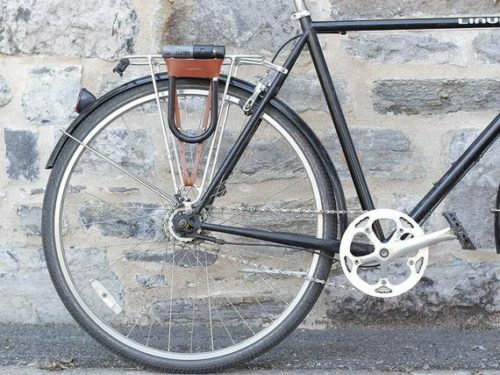 As a bike commuter you’ll want to be able to ride around town with your u-lock. Some people store their u-lock in panniers or a backpack, but many choose to attach the u-lock onto their bike. In this article, I will review the best u-lock bike mounts on the market so that you can easily carry your u-lock on your bicycle. 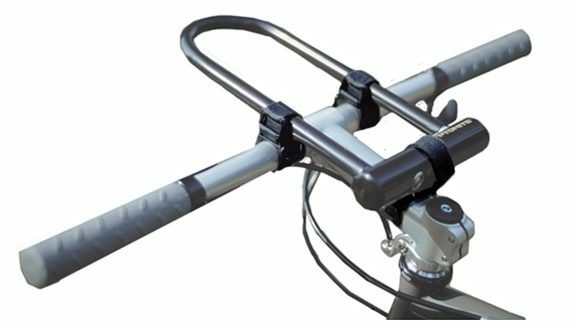 This u-lock bike mount is a simple, easy, and quick way to mount your u-lock onto your bicycle. In my opinion, if you’re looking to mount your u-lock to the bike this is the mounting system to get. To be fair there are some mediocre reviews of this system, but as long as you install it correctly you won’t have any issues with it. This u-lock bike mount will fit any locks that have 13mm or 16mm shaped shackles. You can expect it to work with most of the common u-locks on the market. One of the unique features of this mount is that it allows for a 360 degree rotation to adjust the lock angle to best fit and align with your bicycle frame’s geometry. Pick a spot on your frame that the U-lock won’t interfere with your pedal. Clean the spot you’ll be placing the u-lock mount using a rag with some basic degreaser. Take the tug block with the rubber shim and wrap it around the frame. You’ll want the rubber shim to be 1/4″ inch away from the metal tugblock. Cut off any extra of the rubber shim. You won’t need it. Make sure that the tug block is facing the right direction that you’ll want to mount the u-lock. Feed the strap through the tug block, and pull until it’s nice and snug. Take the bracket body and push it onto the tug block. Next, use the hex wrench and rotate clockwise until everything is good and tight. Be careful to not tighten it too tight. If you tighten too much you can crack the piece. Slide your u-lock onto the bracket! You’ve now officially installed the Kryptonite u-lock bike mount! Kryptonite issued the video below to show how to install this u-bracket onto your bicycle. 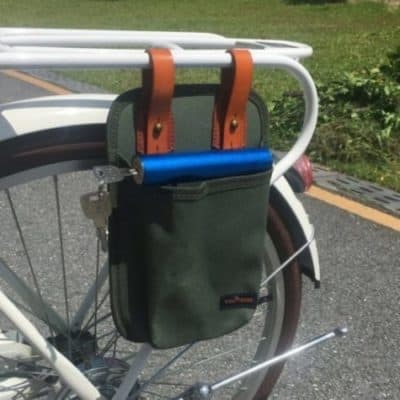 This USA made product utilizes three blocks that velcro onto your bicycle. These “blocks” act as anchors to hold your U-lock onto the bike. The manufacturer, TwoFish, recommends that you use their mounting system on your handlebars as seen above. If you’re in the “I don’t want my U-lock on the handlebars” camp than you’ll be pleased to know that you can use it to attach the u-lock to the side of your frame. Just use the top tube and seat tube for the three anchor spots. The velcro is incredibly tight and secure, and your lock won’t wiggle around if you do it properly. This system works well with extra heavy u-locks. The downside of this u-lock mount is that it takes a relatively long time to attach and remove the u-lock. You have to undo all three velcro spots to get the lock off and on. Obviously this doesn’t take forever, but if you’re getting on and off your bike a lot it can be a bit tiresome! Buy this U-lock mount system on Amazon. 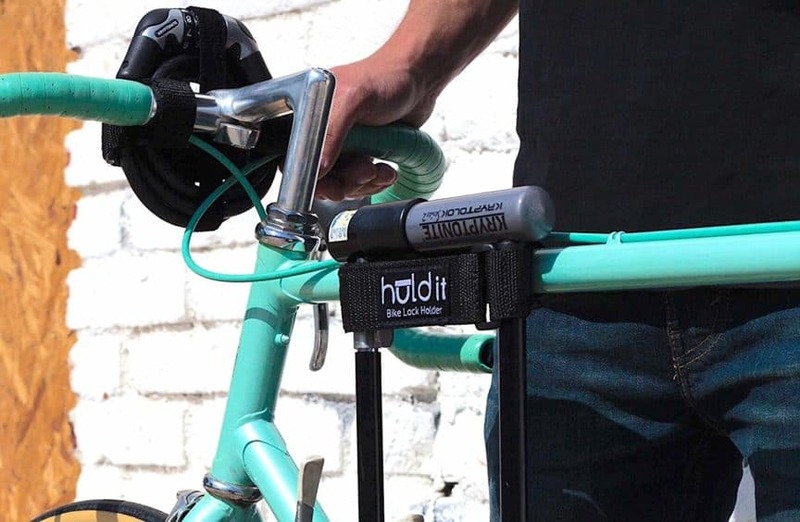 The Huldit is another u-lock bike mounting system that utilizes velcro straps. It’s a simple design, but it’s efficient and works well. The straps have soft rubber on the side that faces your frame to avoid scratching your frame and to prevent slippage. This bike lock holder works on a variety of u-locks including the New York Fahgettaboudit lock. You have the option to mount your u-lock wherever you want on the frame as long as it’s out of the way of any moving parts. Some people chose to attach to the top tube and others prefer the seat tube. 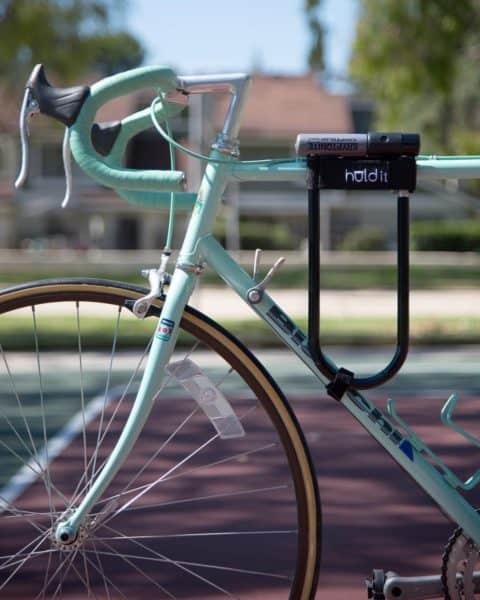 Huldit created a short film on how to install this system onto your bicycle. You can view it here. If you’d like to purchase this u-lock holder, click here to buy at Amazon. Where are the best places to attach my U-lock bike mount? Top Tube – One of the best places to attach a u-lock. 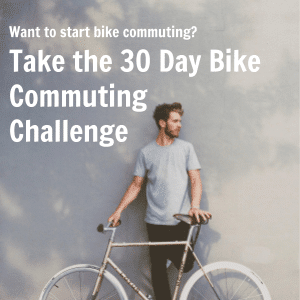 It’s out of the way and is great for those cyclists who are minimalists. No racks needed for this attachment. Handlebars – Not my favorite spot to place a u-lock, because I want the handlebars to be as free from clutter as possible. If you ride with a bell and a light attached to your handlebars than this will only take up more space. I’ve seen bike commuters with this setup and it’s possible, but in my opinion not ideal. Seat Tube – Another prime spot to place your u-lock. 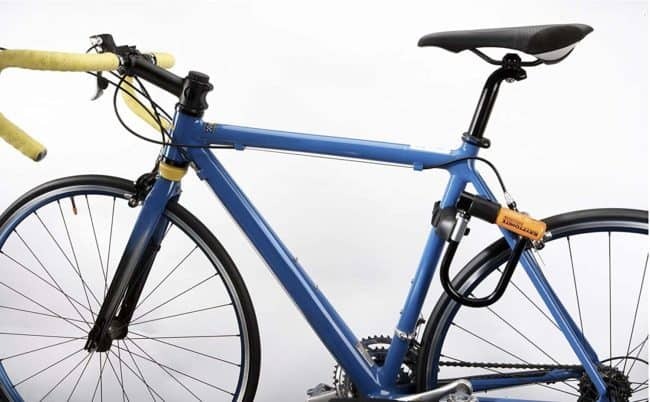 If you choose to install a u-lock bike mount to the seat tube you’ll want to make sure that the u-lock is out of the way from your legs and pedal. You don’t want to catch while riding. Under the Saddle – Not every bike has a seat high enough to allow for a u-lock to fit under it. If you have a seat that rides high than you have the option to place a u-lock under it. Racks – An easy location to attach a u-lock if you’re bike setup includes a front or rear rack. Down Tube – The only reason you don’t often see u-locks attached to the down tube is that there’s usually a water bottle cage in this spot. 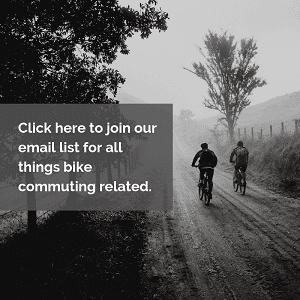 If your downtube space is available than this could be the right location for you!